This is an unofficial list/changelog of new features and various changes to Stack Overflow and the Stack Exchange network. It is maintained by the community, while a Stack Exchange employee changes the accepted answer to ensure that the latest changes remain on top (given default user settings). To see the list in reverse chronological order (latest entry on top), sort Answers by latest activity first. For those adding new features here: please post only feature changes that affect the whole network and have some global impact. i.e. bug fixes don't belong here, nor do mobile app updates. 2019-03-22: The Ask Question Wizard is now live on Stack Overflow. Questions cannot appear on the list for more than 72 hours, from the time they are selected. Each site is limited to contributing up to five concurrent questions to the list. Stack Exchange employees now have the ability to customize title blacklists on a per-site basis (in addition to a shared network-wide blacklist). Moderators have the ability to remove a question from the list after it gets selected. 2019-02-08: The last-bump days threshold to allow re-bumping was modified again. Now, questions bumped by the Community user are not eligible to be bumped again for a period of 120 days, unless some other activity happened after the previous bump. 2019-01-31: The comment delete button now shows as the word "Delete" rather than an "X" icon. 2019-01-28: The user flag summary now has a notice to indicate what flagging means. Additionally, the URL now supports the current parameter, to provide a universal link to one's own flag summary (previously, the URL required the current user's ID). 2019-01-23: Users can now choose which one site to earn the Census badge on (from a subset of technical sites) after completing the Developer Survey instead of earning it solely on Stack Overflow. 2019-01-09: Auto upvotes on close vote comments don't count towards the daily limit anymore. 2019-01-08: Triple backtick markdown (code fences) has been implemented. 2019-01-08: Questions bumped by the Community user cannot be re-bumped for a period of 90 days. 2011-12-28: There's a tag-wiki-specific "not helpful... does not follow any of our tag wiki guidelines" suggested-edit rejection reason. 2011-12-22: The /reputation page now shows the reputation earned from suggested edits. 2011-11-28: The newly redesigned profile pages have been pushed network-wide. 2011-11-28: Spoiler text is now hidden in Questions pages and on front page tooltips. 2011-11-23: New short link for answers in the form of stackoverflow.com/a/[answer_id]. These may also contain a user ID for tracking purposes, but sharing them does not award publicity badges. 2011-11-22: The new-look profiles have been rolled out to Server Fault and Super User, but not the site metas. Also other sites including EL&U, WepApps, Gaming and Ubuntu. 2011-11-15: The profile page has been redesigned and the new style deployed to Meta only for testing. 2011-11-08: The Reviewer badge has been changed to a silver badge with the requirements increased to 1000 reviews and acting on at least 200. 2011-11-07: nofollow removed from links in "reputable" posts. 2011-11-07: New bronze badge "Reviewer" for reviewing 300 posts and acting on over 60 of them. 2011-11-02: When reviewing a suggested edit, you can now reject it with a custom reason. 2011-10-27: The review section now lets you mark posts as reviewed. Doing so allows you to directly take actions on these posts (such as voting, flagging, commenting, …), and hides them from the review section. 2011-10-18: Stack Exchange URL shortener s.tk launched. 2011-10-13: Blogs snippets added to Stack Exchange newsletters. 2011-10-11: "Suggestions" filter added to the activity tab in user profiles, showing all the edits that member suggested and their status. 2011-10-08: Email notifications overhauled and integrated with the global inbox. 2011-10-07: When placing a bounty on question asked by other user, you are getting a notification for new answers on that question as long as the bounty is active. 2011-09-30: When rejecting an edit you can now choose a pre-defined reason. 2011-09-27: "Post Made Community Wiki" now showing the actual reason. 2011-09-26: Links to comments on the profile page will now always take you directly to the comment, even if it would usually be hidden (currently only if the comment is on an answer). 2011-09-23: Moderators can add a notice to a post that will display at the bottom of the post. 2011-09-23: You must be a registered user to ask questions on Stack Overflow. Unregistered users may still answer questions however. 2011-09-22: Users are now notified of unaccepted answers. 2011-09-20: The minimum bounty on a question you have answered is now 100. 2011-09-20: Questions with an identical title to an existing question can no longer be submitted. 2011-09-20: The featured tab now sorts with a weight that gives a Colbert Bump to higher bounties. 2011-09-20: Bounty remarks are now supported. 2011-09-20: The badges page now includes filtering by type. 2011-09-19: @name can now be autocompleted in comments using the tab key, similar to chat. 2011-09-17: Flagging a post for moderator attention, and then casting the final deletion or close vote, no longer earns an increase in flag weight. 2011-09-16 Network profiles no longer use ugly GUIDs, but a pretty account id. 2011-09-16: Management and promotion of newsletter subscriptions. 2011-09-16: Locked posts now include an explanation of why they were locked (example), and can be optionally configured to automatically unlock after a certain amount of time has passed. 2011-09-14: Email notifications for individual questions are no longer available. Instead, users can receive email notifications of unread inbox items. 2011-09-14: Deleting a post that is the master of a closed duplicate will now provide a warning. 2011-09-14: An advanced search option hasnotice:1 has been added to find posts with moderator notices. 2011-09-12: The revision diff list now offers a side-by-side diff in addition to the inline diff. 2011-09-12 Declined flags will now include a reason that is included in the user's Flagging Summary. 2011-09-12: You now have extra delete votes for every 1k above 10k reputation (beta sites may differ), with an upper limit of 30 delete votes per day. 2011-09-12: At 5k rep, users now have full access to the suggested edit queue. 2011-09-11: The minimum amount of rep that can be spent on a bounty now doubles for each successive bounty on the same question by the same user. In other words, if the first bounty on a question starts at 50 rep, the next bounty on that question has a minimum rep of 100, the next 200, the next 400, the next (max). 2011-09-06: Users can no longer single-handedly undelete their own posts if they were deleted by vote; they can only vote to undelete like any other user. 2011-09-06: The sharing buttons are now shown on the trilogy in addition to the SE 2.0 sites. 2011-09-02: Up to 3 concurrent bounties are allowed per user now. 2011-09-02: Voting to close as a duplicate now lists questions that were previously used when closing related questions. 2011-08-24: facebook.stackoverflow.com "mini-site", as the new official developer support channel for all Facebook developers. When using a Facebook account to log in, this also pulls your Facebook profile picture to be used as your avatar, but you can revert that. 2011-08-24: New bronze badge "Analytical" for visiting every section of the FAQ. 2011-08-22: New gold badge "Marshal" for achieving a flag-weight of 749. 2011-08-17: Tools and Review got separate category tabs (on the left) at 10k tools; the /tools link in the top bar remembers the last selection. 2011-08-16: The "links" tab on /tools is gone and now those links are inside other pages like "stats", "close", "delete". 2011-08-15: Excavator and Archaeologist badges added for editing posts that were inactive for 6 months. 2011-08-09: Descriptive error message is now displayed upon image upload failures. 2011-08-09: Improved Tag auto-complete to include tag wiki excerpt. 2011-08-09: Control-Enter in search box now opens results in a new tab/window. 2011-08-08: The search text box now auto-expands to the left when focused, temporarily hiding the top-bar links. 2011-08-06: Proofreader badge for having reviewed 100 suggested edits. 2011-08-02: In the 10k tools, the delete tab now shows remaining needed vote counts. 2011-08-01: Titles that appear to start with a tag now have the tag stripped out. 2011-07-19: Comments containing multiple @name are blocked now unless they contain a backtick. 2011-07-18: Trivial answers containing a link to another question in the network are automatically converted to comments on the question. 2011-07-16: Mobile theme for Stack Exchange sites launched. Users can switch back and forth from the mobile theme using the 'mobile' link at the bottom of every page. 2011-07-15: Anonymous and low rep (<15) users now see a "give feedback" link where logged in users usually see "add comment". When moused over, this shows "Was this post useful to you [yes] [no]". This is just for testing purposes right now - it does not affect the post's score. 2011-07-13: New heuristics blocking posts with no or improper code formatting (only for users with <= 50 reputation). 2011-07-08: Inline post editing is now enabled network wide to people with the editing privilege. 2011-07-07: It is no longer possible to award a bounty to your own answer. 2011-07-07: 10k users can now see the Migrated tab on /tools?tab=migrated, which was previously a ♦ moderator tool. 2011-07-07: Synonymizer badge added for First approved tag synonym. 2011-07-07: Migrating to another site requires 4 migration votes, instead of a simple 3/5 majority as before. This change applies only to Stack Overflow. 2011-07-06: Close- and reopen- votes now age away on a sliding window: if four days elapse without a close or reopen vote, the votes begin aging away. Posts with fewer than 100 views do not expire votes. 2011-07-01: In comments between the post owner and only one other person, @lerting the post owner will be removed from the comment text if it is at the beginning of the comment as it is not needed. (The post owner is always notified of comments on their post.) Moreover, @postowner (or an invalid @lert) does no longer block a subsequent @lert; see #8 in How do comment @replies work? 2013-12-23: There is no "Trigger Reputation Recalc" button anymore. Recalc is performed automatically only. In case of reputation inconsistency that does not resolve itself, please file a new bug report. 2013-12-20: Personal data is now marked private when viewing one's own profile. 2013-12-19: Posts now fade out when flags have been handled in the 10K tools. 2013-12-04: New top bar rolling out on sites. 2013-12-03: Direct linking to a filtered /review queue is now available. 2013-12-03: New Hot Questions sidebar has been introduced in the homepage of each site, "recent tags" and "recent badges" lists removed. 2013-11-27: A user's remaining deletion votes are now displayed on the "delete post" dialog. 2013-11-26: "add comment" link is always visible, even for users with less than 50 reputation points and anonymous visitors. 2013-11-14: The new top bar (beta) is out on Meta Stack Overflow. 2013-11-07 (or earlier): when calculating the Gravatar email hash for those who do not have a Gravatar account, in some cases now a salt is used. 2013-09-20: Duplicates can now be filtered for in search strings. 2013-09-11: The dialog for flagging posts was redesigned in order to streamline the process. For example, the options for spam and offensive are now listed first. Also, duplicate votes are now separated from close votes. 2013-09-06: Any approved edit on a closed question will push the post into the reopen queue. 2013-09-05: New users (< 10 rep) can now post images on any site except for Stack Overflow, Server Fault, Super User and Ask Ubuntu. 2013-08-12? : It is possible to see one's own deleted recent answers and questions. https://stackoverflow.com/users/recently-deleted-answers/<userID> and https://stackoverflow.com/users/recently-deleted-questions/<userID>. Linked from "answers" and "questions" tag in profile page. 2013-08-05: Closing a question will no longer incur an automatic Community downvote. 2013-08-01: (estimated date) Custom comments in flags now supports the same "mini-markdown" renderer used for comments. 2013-07-29: All flags that appear in a user's flagging summary that are not yet dismissed by a moderator have the marking "active" in it. It appears to mean "awaiting attention by a moderator". Source. 2013-07-26: As a counter-measure against robo-reviewing, review ban times now automatically increase based on the amount of previous bans up to a maximum of 30 days. 2013-07-24: Alpha version of android app is released. 2013-07-24: Very Low Quality flags automatically add the flagged post to the Low Quality review queue. If more than one VLQ flag accumulates on the post before the review has ended, a number of "Looks Good" responses equivalent to the number of flags is required to dequeue it. 2013-07-19: The comment textarea now features the hint: "Request clarification or suggest improvements." On Meta it is "Request clarification or add information." 2013-07-15: Close votes can now be retracted. 2013-07-08: When an abandoned question is auto deleted, there is a proper reason added to the post history record. 2013-07-07: Comment flags are now listed in full detail in a user's flag history. 2013-07-03: When a moderator accesses private information about a user (such as their e-mail address, full name and IP address), this action will be logged in the user's history. 2013-07-03: Comments can now be undeleted by moderators, unless they were deleted by the OP of the comment. 2013-07-03: Close review history made available to 10K users and mods. Later, other review histories were also made available (no official announcement found for that). 2013-07-02: Flags to close a question are no longer shown in the moderator only queue. 2013-06-27: New design for privilege page with privilege categorization and a progress bar to track progress to the next privilege. 2013-06-26: The question and answer ban messages now link to the help center, and the help center pages no longer link to What can I do when getting “Sorry, we are no longer accepting questions/answers from this account”? 2013-06-26: Flagging limits changes: You start with 10 flags per day, you can end up with as many as 100 per day. You get an extra flag per day for every 2000 reputation points or 10 net helpful flags (helpful-unhelpful). 2013-06-19: Badges page is incorporated into the Help Center and gets a new tabbed design, cross network. For example, Stack Overflow badges page. 2013-06-03: The new Help Center replaces FAQ pages on all sites. 2013-05-31: Collaborative effort lock experimental feature introduced for questions where the primary value arises from the community's regular efforts to keep them updated via edits. 2013-05-28: Diamond moderators are now allowed to comment on deleted or locked items. 2013-05-22: Edit timestamp of posts is now wholly clickable, including the "Edited" word itself. 2013-05-17: Edits reverted during the grace period will now remain in the post history instead of vanishing. 2013-05-08: Retag option from questions is removed. Editing tags only will result in the same behavior as retag. 2013-04-23: Changes to the treatment of deleted content: Deleted questions will be visible to their authors, regardless of those authors' reputation; and delete-voting within two days of closing is disabled on questions scoring -2 or above, regardless of the voter's reputation. 2013-04-22: A new footer is implemented on all sites. It links to a new grid view of all Stack Exchange sites. 2013-04-02: Users are now shown a persistent (but dismissable) banner linking to /about on the site. 2013-03-26: The Linked and Related lists on the right sidebar are now displayed with larger text and with the score for each question. 2013-03-26: The Close (or Delete) link shows only the number of votes cast. A tooltip (on hovering) displays the remaining required votes. 2013-03-22: If a closed question is edited by the asker within 5 days, it is added to the reopen queue. 2013-03-20: Users are now blocked from posting comments consisting only of "what have you tried". 2013-03-19: A "delete" link has been added after "edit" for comments on mobile theme. 2013-02-21: New image upload is being tested on Meta, adding support for paste and drag-and-drop. 2013-02-19: When a comment thread contains a comment by a user whose name starts with a non-ASCII letter (e.g. Я) and you write new comment, just typing @ will bring the tab completer up with that name. 2013-02-18: The revision history of a question that was closed as a duplicate is now showing the chosen originals as part of the "Closed as duplicate" notice. 2013-02-11: If a visitor is not logged in or doesn't have enough reputation to vote, the vote system redirects the vote to the anonymous feedback system, and shows a small blue dialog. 2013-02-06: The auto inserted text for questions closed as duplicates has been changed to "This question already has an answer here:" followed by link to the other question and the number of answers it has. The text is no longer edited into the original question but rather displayed externally. While the question is still open, only the OP sees the message and it becomes visible to everyone once the question gets closed. Questions closed as duplicate prior to this change still have the old "Possible Duplicate:" text in them. 2013-01-29: Automatic review suspension has been introduced. We're kicking blatant abusers out of the queues automatically now. Included are often-hilarious "honeypot" fake suggested edits. 2013-01-22: Accept rates will no longer be shown. Like flag weight, they will continue to be calculated for backend use. 2013-01-22: A question closed as a duplicate now gets a " [duplicate]" appended to its title, rather than just " [closed]". It also shows "marked as duplicate" instead of "closed as…" in the post notice. 2013-01-10: First version of the new 'About' page rolled out to act as Quick Start guide for new users. New Bronze "Informed" badge for reading the entire page. then you won't see that post in the Reopen Queue. 2013-01-10: An alternative to Gravatar has been rolled out network-wide. 2013-01-04: A new elasticsearch-based search engine has been rolled out across the network. New features include multi-term searches defaulting to AND rather than OR, word stemming, excluded terms -term, infavorites: coming back, ranges for answers: and created: and score:, and more. 2012-12-14: CSS of Stack Overflow and Meta Stack Overflow has been updated, mainly "thinning down" text. 2012-12-14: "No Action Needed" button has been introduced in First Posts and Late Answers review queues. 2012-12-13: Suspending reviewing privileges has been introduced for those who fail multiple review audits in a short time. 2012-12-03: When an abandoned question is auto deleted, a post history record is being created and attributed to the Community user. 2012-11-30: Vote to close -> offtopic from Stack Overflow adds SharePoint; removes Server Fault. 2012-10-19: Review actions limits have been changed: after 20 reviews in a given queue, you're done for the day - if you want to continue reviewing, you can switch to a different queue. Limit is doubled for queues with large backlogs. 2012-10-17: Reopen Votes review queue has been introduced to vote whether or not to reopen closed questions. 2012-10-16: The number of reviews required to accept/reject suggested edits has been increased to two network wide (versus one before) and three on Stack Overflow (versus two before). Moderators can still cast the final vote like before. 2012-10-01 (likely earlier): suspension reason "This account is temporarily suspended for asking programming questions on MSO" introduced. 2012-09-22: Voting allowed (and encouraged) in First Posts and Late Answers review queues. 2012-09-21: New badges added for completing community review tasks. User can earn Custodian (1 review), Reviewer (250 reviews) and Steward (1000 reviews) once for each review queue (Close Posts, First Posts, Late Answers, Suggested Edits and Low Quality Posts). The previous Reviewer badge (for reviewing posts in the old system) will no longer be awarded. 2012-09-08: You must be a registered user to ask questions on Programmers Stack Exchange. Unregistered users may still answer questions however. 2012-08-15: Canned Comment Feedback Dialog for Community Review page. 2012-08-13: Review audits are introduced: known cases thrown into review queue as "gotchas" to keep people from just nailing "Looks Good" or "Close" or whatever without reading the posts. 2012-07-13: The Help Center has been added. It contains pages for many common issues, offering suggestions and a form to email the team as needed. This is the new target of the "contact us" link in the footer, which was previously an email link. 2012-07-12: The new Community Review Tasks system is now in beta on the trilogy. 2012-07-06: The edit link is now disabled instead of hidden for registered users who cannot edit the post. The tooltip will display a reason such as "Post is locked". 2012-06-08: New badges Caucus and Constituent, for browsing an election page and for voting in an election; announced on the blog. 2012-06-05: Vote to close -> offtopic from Stack Overflow adds TeX, DBA; removes Programmers and Webmasters. 2012-05-21: Notifications tab in the multicollider (next to the inbox). 2012-05-18: You can answer your own question at the time of posting by ticking the “Answer your own question” checkbox below the “Post Your Question” button. 2012-05-10: When there is a community moderator election it is noted in that site's newsletter. 2012-05-05: Keyboard shortcuts (created with <kbd>) on all sites are now rendered like they've always been on Ask Different, with a less boxy layout. 2012-04-30: Suggested edits that change the post's title now have no minimum on the body edit. 2012-04-26: Stack Exchange is experimenting with automatically following links and might post comments and add them to a list on the /review tab when they are dead. 2012-04-26: New votes tab on user profile, clearly you can only see your votes. You can see deletions/undeletions/closures and reopens as well as up/down votes (source). 2012-04-20: On Stack Overflow, 50 votes available daily for suggested edits, not 40 and edit queue increased to 200. 2012-04-16: The Visit Meta box is replaced by an enhanced Community Bulletin box. 2012-04-12: It is now possible to undo comment votes within 60 seconds of casting them if you don't navigate away. An undone vote cannot be recast. 2012-04-06: Accounts tab has been removed from user profile page. Top 5 accounts are still listed in the Summary view, header and "view more" link to the Stack Exchange accounts page. 2012-03-26: Migrations can now be rejected: if the question is closed (as OT/NC/NaRQ) at the destination site, it becomes merely closed as off-topic on the source site. 2012-03-20: Manual deletion of saved drafts. 2012-03-15: When anonymous users visit a question that is closed as duplicate and has no answer, they are automatically redirected to the duplicate. 2012-03-15: 'Live updates' implemented on Stack Exchange sites; due to heavy activity, the feature is limited to tags view on Stack Overflow. 2012-03-06: The new Stack Exchange beta theme has started to be rolled out across the network. 2012-03-05: Questions locked for historical significance no longer show up in question lists and their vote buttons are removed (example). 2012-03-05: You should keep the reputation for the post even if it eventually gets deleted if it has score of 3 or greater and is visible on the site for at least 60 days. 2012-02-27: Updates to the homepage are now pushed live via web sockets. Initially deployed on Meta, and gradually being deployed to other sites. 2012-02-22: Automatic question banning calculation has been changed on Meta to better reflect the idea that downvotes can be much more common on meta, for reasons that aren't necessarily related to quality of the post. 2012-02-21: Vote counts now include votes cast on deleted posts. 2012-02-15: The "Welcome to <site>..." banner message displayed to new visitors has been removed due to low usage. 2012-02-07: New silver badge for editing 50 tag wikis (not counting excerpts) introduced: Research Assistant. 2012-02-02: Local metas' tag wikis are now locally editable. 2012-01-30: Comments can now be easily linked to using the permalink on their timestamps. 2012-01-30: Suggested edits can now be marked as unhelpful when selecting the "Improve" option, causing the Community user to decline the suggested edit with no reputation bonus to the suggester. 2012-01-26: Google+ sharing replaced LinkedIn sharing. 2012-01-20: Flag weight was removed from user profiles. Users having flags now see a "helpful flags" count on their own profile linking to the flag audit page, which now contains a breakdown of flag outcomes by flag type (moderator attention, spam, offensive, comment). The Deputy and Marshal badges were modified to require a number of helpful flags (80 and 500, respectively) instead of a specific flag weight. 2012-01-20: "very low quality" flags now carry an automatic downvote from the Community user with them, and are dismissed when the post is edited. 2012-01-16: The populist badge will no longer be awarded for self-answers. Also note that losing your qualification for a already-earned badge will (usually?) no longer result in your next badge of the same type being withheld. 2012-01-10: The Announcer, Booster and Publicist badges can now be earned multiple times and they can also be earned for the same question. The time limit has also been removed. Sharing direct links to answers now also counts towards these badges. 2012-01-03: Users asking questions with auto-caught bad titles will now be offered a link to Mark Harrison's post on writing good titles. 2014-12-10: Status of suggested edits is now displayed in your activity history as either of pending, approved, rejected. 2014-12-06: Very Low Quality flags are not available for questions under close and triage review. 2014-12-04: Triage review introduced for testing at Stack Overflow. 2014-11-27: Profile page re-design in being tested on MSE. 2014-10-17: Introduced an option to have a tag-specific popup (aka Tag Warning) to guide question askers and editors. 2014-10-07: New rejection reason for suggested edits that don't make any positive changes to the post: "no improvements whatsoever". 2014-10-01: Intra-word emphasis now works. 2014-09-25: Chat Autocomplete improvements. More matches shown, gravatars shown, shows spaces in names. 2014-09-19: Changes to user signup and profile editing. 2014-09-17: Rate limiting of asking questions testing at Stack Overflow (extended to Programmers since 2014-09-24). 2014-09-11: iOS app refined for iPad is released for alpha testing. 2014-09-10: Suggested edit review offers a new button “Improve Edit” instead of “Improve”. This action will fail any known-bad audits, while "Reject and Edit" action will pass these audits. 2014-09-09: Snippets on answers scoring -3 or lower are disabled. 2014-09-09: Numbered list can now start with any number, not just 1. 2014-09-08: "Too minor" was removed from the suggested edits reject reasons list. 2014-09-05: Suggested edit review offers a new button “Reject and Edit”. 2014-08-29: Posts in the Suggested Edit queue are "checked out" to a specific person for a period of time (currently 3 minutes). 2014-08-25: Runnable code snippets are being tested on Meta Stack Overflow. 2014-08-21: When a user without full editing privileges suggests a new edit, he now sees a warning if some of his edits were rejected. 2014-08-20: "You can only submit a comment vote every 5 seconds" throttle removed. 2014-08-19: In case of an edit conflict resulting in automatic rejection of a suggested edit, a message is now displayed to explain what happened. 2014-08-13: Moderators can move comments to chat. 2014-08-12: 8-hour delay on self-answers eliminated entirely. 2014-07-25: Comment threads show a choice between revealing all comments and directly adding a comment. The latter implies the former yet allows users to add a comment with one click. 2014-07-18: Review-Overview now returns values cached for a short period of time. 2014-07-17: One can now flag a comment after upvoting it. 2014-07-09: Multiple periods at the end of comment reply (e.g. @Joe...) are now ignored. 2014-07-08: 10K users can vote to undelete posts removed by Community for inactivity. 2014-07-02: Everyone can now view skipped items in their review history. Moderators can see everyone's skipped items. 2014-07-02: Asking days badges have been introduced: Curious, Inquisitive, Socratic. 2014-06-27: Spam/Offensive flags on Area 51 do not expire automatically any more. 2014-06-23: Community Bulletin got some love and new design, on all sites. 2014-06-12: When community wiki status is removed from a post reputation is automatically recalculated as if the post was never a wiki. 2014-06-10: When moderators or users with the "create new tags" privilege attempt to create one or more new tags either while asking a question or during an edit they are shown a confirmation dialog to reduce risk of tags created by mistake. This feature is enabled on a per-site basis. 2014-06-09: In close vote review audits you'll have to actually select a close reason and click Vote before passing / failing. Voting to close as duplicate won't fail "known good" audit. 2014-06-08: Blatantly off-topic option has been added to flag to close dialog on all sites, for questions that have no connection to a site's topic at all. 2014-06-01: Post status banners (e.g. Closed, Locked) moved directly under the posts on which they're applied. 2014-05-19: Easy close review queue filtering interface - currently enabled only on Stack Overflow, with a threshold 50 for how many outstanding reviews there must be with a tag or close reason in order for it to show up on the dashboard. 2014-05-15: In order to fail or pass a review audit you now have to actually submit a flag or close vote. 2014-05-13: Users with gold tag badge have binding votes to close and reopen duplicates in that tag. 2014-05-13: Anti-Recidivism System Added that deal with users who request deletion in order to evade restrictions that are placed on their accounts at the time of deletion. 2014-05-12: Stack Exchange API v1.0 and v1.1 endpoints have been shutdown. 2014-05-09: Featured questions from MSE now show up on community bulletin across the network. 2014-05-08: Official iOS app for Stack Exchange is available in App Store. 2014-05-06: A custom message can be set (only by staff) when a user tries to submit blacklisted content such as tags. 2014-04-29: 10K users now see the total number of pending review tasks in the top bar instead of just pending suggested edits. 2014-04-28: Aging rules for questions to leave and re-enter close review queue are introduced. 2014-04-28: Users are now warned when deleting a post could lead to a question ban. 2014-04-28: Graying out downvoted answers in meta discussion questions now happens at a new threshold of: -8. 2014-04-22: The 10k flag queue has been removed from all sites. 2014-04-17: Moderator record tools for annotations and moderator messages were revamped. 2014-04-16: Meta Stack Overflow and Meta Stack Exchange have officially split off from each other. 2014-04-09: Former criteria for the automatic conversion of community wiki have been removed. Instead, flags will be cast in select situations for moderator attention regarding multiple edits to a post or multiple answers to a post. 2014-04-09: Moderators can now provide a reason when manually review-banning users. In addition, the message on automatic bans triggered by failed audits includes a link to at least one such failed audit. 2014-04-08: Auto-protection for questions that get more than N answers from new users in a 24-hour period. N is: 5 by default, 20 for Code Golf, 3 for Programmers, Workplace, ELL. Users with privileges to protect (15K) can now unprotect any protected question. 2014-04-05: When a post is deleted by six "Recommend Deletion" votes from within the review queue, "Post Deleted From Review" message will be added to the post history. In addition, when the post author undelete such a post, "disputed low quality review" auto flag is raised. 2014-04-?? : Chat now has the new top bar, as do Area 51 and the StackExchange.com hub. 2014-04-?? : Tag popup contains amount of questions having that tag. 2014-03-19: MathJax now works over HTTPS. 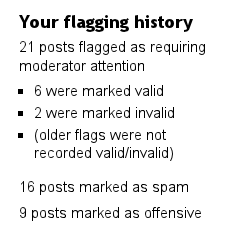 2014-03-17: Moderators can now dismiss flags on the same post individually. 2014-03-11: Moderator Newsletter updates are now pushed to the Top Bar Moderator Inbox. 2014-03-11: Top Bar Moderator Inbox now includes snippets from moderator messages in the alerts. 2014-02-28: UI for moderators to reply to helpful flags. 2014-02-27: The number of questions in the close review queue is now fuzzy. 2014-02-25: The Top Bar now uses universal colors network-wide when depicting flags (blue) and suggested edits (beige). 2014-02-25: Hot questions list at sidebar is now randomized. 2014-02-25: The order and choice of sites on the top-left site switcher can now be customized. 2014-02-13: Comments on election nominations can no longer be flagged. There will be extra monitoring to ensure this doesn't result in abusive comments. 2014-02-10: iOS app Alpha version released. 2014-02-03: Improving a suggested edit is now considered more substantive than an approved suggested edit (details). 2014-01-27: The Stack Exchange Android app is in public beta. 2014-01-24: The mobile site now uses a mini version of the improved topbar. 2014-01-15: Migration notice refers to question revision history at source site. 2014-01-?? : Moderators can now see who validated a chat offensive flag in the flag dialog. 2015-12-23: Question timeline (not moderator timeline) got a new design and features, e.g. showing who voted to close or reopen, and more. 2015-12-09: Users with 10k reputation can now use the deleted:1 advanced search operator to search their own deleted posts. 2015-11-09: Comments auto-added from review queues now indicate as such. 2015-10-28: All posts reviewed will remain visible to their reviewers in the context of the relevant review task. "Skip" does not count as a review for this purpose. 2015-10-23: It is now possible to filter your flag history by type: "links which can be used to easily see declined, disputed, helpful, etc outcomes of your flags". 2015-10-20: More consistent “Flagged Posts” page: "The stats presented should now be consistent across all flag types, including waiting for review, disputed, declined, aged away, etc." 2015-10-10: New Help Center page for automatic deletion, linked from deletion banners: "This question was automatically deleted. Please see the help center for more information." 2015-10-08: Dupehammer got a new design, and now applies to current tags rather than original tags, but is disabled if you edited the tags. 2015-10-05: Automatic deletions by Community are now annotated with an indication of reason: one of RemoveMigrationStubs, RemoveDeadQuestions, RemoveAbandonedQuestions, and RemoveAbandonedClosed. Explanation of reasons. 2015-09-29: Bar for reputation for late answers to enter the review queue raised from 10 to 50. 2015-09-16: Some metadata about deleted posts made available in Data Explorer. 2015-09-02: Tag badges can now be tracked by users that have not acquired all privileges. 2015-07-22: Image uploader automatically wraps images in a link to themselves. 2015-06-16: Checking the "community wiki" box when posting an answer now displays a confirmation dialog. 2015-05-05: "Inappropriate" flag option for posts renamed again, now it is "rude or abusive". 2015-04-22: Flag dialog has been reworded for both questions and answers. Closing categories are now stated on the primary screen; "offensive" renamed as "inappropriate". 2015-04-20: Questions deleted as spam/inappropriate now have the body and title hidden from view (example), as was previously done for answers. For users under 10K, the "not found" page no longer contains suggestions for search. Also, there is no slug in the URL for such posts. 2015-04-15: New profile pages have been launched on most Stack Exchange sites. These feature separate "Profile" and "Activity" sub-pages. See, also, the blog entry: Two new user pages. One new stat. This one’s big..
2015-04-08: Moderators able to manually ban users from suggesting edits. 2015-03-23: Criteria for making an entry in post revision history have changed. Question edit grace period ends once an answer has been posted, and any post's grace period ends when someone other than the poster adds a comment. Rollbacks and edits of rollbacks now always create entries in the revision history. 2015-03-20: All questions flagged Very Low Quality now immediately enter Triage instead of Low Quality review queue at Stack Overflow. And while these questions are being triaged, they're not shown on the home page. 2015-03-05: The Help & Improvement review queue introduced for testing at Stack Overflow. 2015-03-02: Modernized close vote and close flag aging logic. Aging votes and flags starts after 14 days, regardless of view count. Allowed re-casting votes and flags that've aged away after 14 days. Triage review (currently Stack Overflow only) instantly disputes flags if the consensus is not "unsalvageable". This would go into effect for current and future votes. 2015-02-23: New “User Activity” page has been launched on MSE, seeking feedback from the community before applying it network wide. 2015-02-13: Review page on main sites now links to reviews on meta site. 2015-02-07: Questions that are too old to migrate (60+ days) are now explicitly stated as being too old when attempting suggest migration through flagging. 2015-02-03: When opening the flagging box, if a flag was cast previously, now the system accurately identifies which kind of flag the user previously cast. 2015-01-30: Users can't vote to delete posts that are the target of duplicate(s). If a user (moderator or any other user) votes to delete a question that has duplicate questions linked to it, their vote won't go through and they would see a warning about why. 2015-01-28: ML / Prediction data made available to users – a page that lets you see what our algorithms think, download the data, and disable the predictions if so desire. 2015-01-28: Very Low Quality and Not An Answer flags do not enter the moderator queue for 15 minutes after they're raised. This applies network-wide, except on Stack Overflow, Mathematics, TeX, Salesforce and Stack Overflow em Português (where the delay is a full hour) and meta sites (where they enter the queue immediately). 2015-01-26: When logged in to private beta, user can now choose between real name and display name when inviting a friend to join. 2016-12-08: Migrated questions are deleted automatically 30 days after being rejected. 2016-11-28: Questions that have been "randomly poked by the Community user" to the front page are now indicated to have been bumped via a banner. 2016-11-24: Manual and automatic review bans can escalate beyond 30 days. 2016-11-18: new 10k tool under /tools that provides a list of protected questions. 2016-10-21: "vote down" privilege is awarded at 100 reputation here on Meta Stack Exchange. 2016-10-12: Users with rep >= 15 and < 50 will now be able to flag posts as "should be closed" on the flagging dialog; this includes duplicates. Previously, this was restricted because these users did not have the ability to comment. 2016-10-12: Users without the privilege to comment can no longer edit comments that are automatically generated on their behalf, such as trivial answers being converted to comments, moderator conversions, and "possible duplicate" comments. 2016-09-29: If a user’s comments are consistently flagged as rude/abusive or not constructive, a moderator flag is raised. 2016-07-21: Stack Overflow Documentation Beta - community-curated, example-focused developer documentation, based on the principles of Stack Overflow. 2016-07-13: Suggesting edits is rate limited to at-most 20 pending suggested edits per editor on beta sites and at-most 5 pending suggested edits per editor on graduated site. 2016-06-30: Improved IME Handling is now active for comments in all Stack Exchange sites. 2016-06-30: The minimum reputation required to post on MSE has been reverted to 1 reputation. All remaining unread 'Terms of Service changed' inbox items have been expired. 2016-06-28: When a question is closed as a duplicate, its originals are examined for dupe votes pointing at the now-closed duplicate - these votes are then invalidated. 2016-06-14: The Stack Snippets UI has been upgraded. We improved the user experience and UI to: Create visual hierarchy (AKA "easy to use") in the editor and in the snippet inside the post, improve the visual design, and fix some design issues. 2016-05-18: A virtual console has been added to Stack Snippets. 2016-05-13: Option to set site-specific new-user ask limit is restored and is back to 90 minutes at Stack Overflow. 2016-05-04: PostHistory record added when Community bumps a post (there's no record prior to May 4th, 2016). 2016-05-03: The new-user ask limit is now one question every 40 minutes, network-wide. That means only 1 question every 40 minutes on Stack Overflow, but also means you'd need to wait 40 minutes after asking a question on, say, Woodworking to ask a related question on Crafting or Home Improvement. 2016-04-21: MSE temporary raised the minimum reputation to post questions and answers to 2 from 1 for an undefined period. 2016-04-19: A Terms of Service update restricting companies that scrape your profile information without your permission. 2016-04-11: On meta sites, deleting a user's account will no longer automatically delete negatively-voted posts they own. 2016-04-06: Cross-site posting rate limits apply to new users on every site forcing a waiting period between posting a question or answer after having previously posted one anywhere else on the network. 2016-03-31: Users can ask on per-site-meta about their own posts (questions and answers) even when their reputation is less than 5. This works even if their post was deleted. 2016-03-23: Users can see review tasks linked in the timeline once they're not currently live (completed or invalidated). 2016-03-21: Common link shorteners are blacklisted in posts at Stack Overflow. 2016-03-16: Comment options in the low quality review queue for post older than 6 months, is reduced the "link only" option. Also, comments generated from review would be deleted once a week, unless it resulted in either deletion or a conversation. 2016-03-15: 15K users can't protect a question if it has no answers from new users. 2016-03-02: New moderator-only page is now available, called Duplicate Comments, allowing moderators to detect and handle users posting series of identical comments to spam/abuse the site. 2016-02-15: Users can now choose which site to sync the network profile's "about" text from, and this text is no longer automatically refreshed every day. 2016-02-15: Users can now choose whether to see more ads if they've reached the "Reduce Ads" privilege. 2016-02-01: Post deletion is now included in the heartbeat, and will trigger a popover message indicating that the post has been deleted while you're viewing it. The flag dialog will also prevent you from opening it if the post's state has changed (deleted or closed) since you loaded the page. 2016-01-20: Spam and offensive flags on a post will be preserved when the post's author deletes it. 2016-01-19: Moderators can now change the edit summary of revisions. 2016-01-18: Chat room owners and moderators are now notified when a user is kicked. 2016-01-12: Sidebar width has been standardized at 300 pixels on all sites. 2016-01-06: Global authentication is replaced with Universal login, network wide. In a nutshell, it means that once you have an account in one site, all you need to do to login into another site is click "join this community", without re-entering any credentials. 2011-06-26: the old edit summary text is now brought up in some circumstances, including during follow-up edits within the 5 minutes grace period. 2011-06-24: Moderators can now see deleted comments. 2011-06-23: The auto-award period of bounties has been extended 24 hours past the true end of the bounty. 2011-06-21: (Date approximate) Anchored links to the FAQ, e.g. https://stackoverflow.com/faq#bounty, now highlight the specific FAQ entry at the top of the page. 2011-06-20: New bounty tab on user profiles. 2011-06-15: The “subjective and argumentative” close reason has been replaced by “not constructive”. 2011-06-14: Suggested edits are now enabled for closed questions. 2011-06-10: When adding a new comment to a post with many comments between two users in a short time, a link is provided to create a chat room to continue the conversation. 2011-06-10: Questions on a few sites (German, Japanese, Judaism) that appear to be written in a foreign language are excluded from the multicollider, the SE home page, SE 2.0 ads and SE tweets. 2011-06-09: In addition to being favorited, tags can now also be ignored from the tag popup. 2011-06-07: [tag:...] syntax works in comments, but is styled as a normal link instead of a tag. 2011-06-07: Flag counts are now shown in the top bar, and the flag page is redesigned (10k users). 2011-06-07: The accounts tab has a button to copy login credentials to all Stack Exchange accounts. 2011-06-06: Greetings are removed automatically from questions and answers before they are posted. 2011-06-06: A number of magic links are available for use in comments. 2011-05-31: More substantive edits are favored when 2 edits at the same time clash. 2011-05-17: Flagging comments shows a popup with flag reasons, similar to flagging posts. 2011-05-16: Similar Questions are now shown when composing a question, based on the question title, body and tags. This is similar to the “Related” questions in the side bar after posting the question. 2011-05-16: When a bounty is started by the question owner and the owner accepts an answer during the bounty period, the full bounty will be awarded to that answer unless the owner explicitly gives it to another answer before the bounty expires. 2011-05-12: Question downvotes are "free" to the downvoter and will not be subject to a -1 rep penalty. Downvotes to answers are unaffected and still "cost" 1 reputation to cast. 2011-05-09: Vote counts on profile don't show votes cast on deleted posts anymore. 2011-05-09: Vox populi badge added for those who used the new maximum 40 votes in a day. 2011-05-09: Tag popup in the Favorite and Ignored tags sections on the homepage sidebar has been removed since the "X" moved inside of the tags themselves. 2011-05-08: User profiles now separate vote counts based on post type (question/answer). 2011-05-07: Images uploaded to SE sites now have i.stack.imgur.com as their URL domain. 2011-05-03: In addition to the 30 general votes users can cast per day, there are now an additional 10 question-only votes. 2011-04-29: Users are limited to posting 70 50 questions over the last 30 days. 2011-04-29: New inline Markdown help, shown by default to new users. 2011-04-28: New suspensions might now publicly show a reason. 2011-04-27: Some returning visitors from Google now get a welcome back and reminder to vote. 2011-04-27: Tag sets were renamed to filters and improved by cleaning up the UI and allowing you to view only the sites that you have an account on and only your favorites. 2011-04-27: At 200 rep, a review entry appears in the top menu. 2011-04-25: You can now use the is: operator in the search box to specify if you want to search only in questions or only in answers. 2011-04-22: You can now delete alternative OpenIDs at your profile. 2011-04-19: Flag weight is now visible to all users. 2011-04-14: Daily number of close votes on all Stack Exchange sites have been increased from 12 to 24, and 50 on Stack Overflow. 2011-04-14: Questions closed as “not a real question” and “off topic” get an automatic downvote (excluding questions that get migrated elsewhere). 2011-04-11: Questions with enough answers to push them into CW will have the new answer field replaced by an "Answer This Question" button, which asks the user to read through the existing answers first to make sure the new answer isn't a duplicate. 2011-04-10: Migrated questions now show [migrated] instead of [closed]. 2011-04-09: New users (<100 reputation) can no longer answer their own question within 8 hours. 2011-04-08: Votes that were undone (revoked within the undo window) are no longer locked in; one can now come back later to cast a new up/down vote. 2011-04-08: New answerers (<100 reputation) get dynamic help when focusing the answer box. 2011-04-08: The aggregate stackexchange.com profile has improvements from the course of several days. Details of its current capabilities are in the blog. 2011-04-07: Posts deleted by a moderator now include a link to the FAQ, and can no longer be undeleted by a non-moderator. 2011-04-04: The 404 page shows more specific error messages. 2011-04-04: The aggregate stackexchange.com profile is now accessible from any of your user profiles. 2011-04-04: Question up-vote rules now sync to meta and can only earn +5 instead of +10. 2011-04-03: User's flair now got a separate tab on owner's profile. 2011-04-01: The possibility to see downvotes exercised by other users in the redesigned reputation tab of their user profile has been removed again. 2011-03-30: When saving a post that was meanwhile edited by someone else, a warning is shown. 2011-03-29: Clicking your flag weight (in your profile) now brings you to a summary of your flag history. See also: How to read the flagging summary? 2011-03-29: Clicking the link button on posts now creates a popup from which the link can be copied, instead of being the link itself, after feedback on UI.SE. 2011-03-29: searching Markdown source for URLs supported again, like by using url:"http://blog.stackoverflow.com/*". 2011-03-25: The accounts tab on a user profile has been redesigned and now pulls the view from stackexchange.com. Accounts are now sorted by reputation in descending order. 2011-03-23: If you flag a question as "does not belong" while you still have usable close votes, the flag will instead be converted into a vote to close. 2011-03-21: The 6 character minimum length for suggested edits is a bit harder to fool. 2011-03-16: Moderators can now remove community wiki status from a post. 2011-03-11: The envelope in the header next your display name linking to recent activity has been changed into a dropdown menu that opens a popup overlay with information and links. 2011-03-11: The tags page has been redesigned. 2011-03-10: The flag weight can now go up to 750, with sub-linear growth beyond 500. 2011-03-10: Auto-deletion of low score, zero answers questions has been extended a bit. 2011-03-10: Micro-refinement to inbox, you are now notified if post author answers your comment, even if they forget the @, if you are the only person who has commented so far. 2011-03-10: The user profile page has been reworked. The reputation tab has been reworked, and some tabs have been separated to the top of the page. 2011-03-09: There is a new "responses" tab in your user profile that lists activity by others on your content. 2011-03-07: You can now manually specify the language used in code snippets that will be passed to Prettify after saving the post. 2011-03-01: The users page has been redesigned and now hosts user leagues. 2011-03-01: When browsing with a mobile device, you get a rudimentary, "slimmed down, minimalistic" CSS theme. This overrides per-site themes. 2011-02-25: The log out link can now be found by going to your user page. 2011-02-25: Automatic titles of internal links are now also shown in the preview. 2011-02-22: Requirements for achieving the Strunk & White and Copy Editor badges have changed. Now it only counts how many revisions are made, not individual title or body changes. Each requires 80 and 500 revisions respectively. 2011-02-22: Users can now see their own flag weight on their profile page when it is sufficiently high or low. This value is also visible to moderators. 2011-02-21: You can now embed ads for Area 51 proposals to help support and promote proposals and beta sites. 2011-02-21: A user's flag weight is now considered in adjusting the number of moderator flags a user gets each day. The details can be found here. 2011-02-20: Marking inline code with backticks ` now works almost the same in comments as in questions and answers, and bold & italic is now also possible in comments. 2011-02-17: /review pages now present posts in random order, to "get more eyeballs on more posts". 2011-02-11: Stack Exchange API 1.1, and improved App Gallery. 2011-02-10: Vote to delete answers implemented and available to 20K users. Answer must be -1 or lower and needs 3 votes. Vote to delete questions not time limited for 20K users. Again 3 votes required. 2011-02-09: Migration now does tag checks. During migration, tags will be checked (and replaced if found) for tag synonyms on the destination site. Tags that do not exist on the destination site will be stripped from the question. If the previous steps leave a question with no remaining tags, it will be closed as off-topic on the original site and not migrated, unless it had only one tag that also is a "global tag" on the destination site (e.g. latex questions can be migrated to TeX.se and will be untagged). 2011-02-09: Flagging for moderator attention now counts for the Citizen Patrol badge. This change applies retroactively. 2011-02-09: Privilege changes: Create tags has been raised from 150 to 300. Retag has been raised from 200 to 500. A new 5k privilege to approve or reject tag wiki edits has been added. A new 15k privilege to protect a question has been added. The question must be older than a day. You can also un-protect a question you protected, but not one that has been protected by someone else. The requirements for editing a tag wiki have been simplified to a 20k rep privilege. 2011-02-08: The Stack Exchange Data Explorer now allows you to view and download query execution plans. 2011-02-07: The Markdown preview area now renders embedded tags (the kind created with[tag:tags] syntax). 2011-02-06: The "all sites" tab in the global inbox is now sorted by your reputation, if above 200. 2011-02-02: Moderators can now send private messages to users, through the website. The addressees will see a top-bar notification, and can reply to the moderators. 2011-02-02: Comments get an inline drop-down mini-help. 2011-02-02: The queue of suggested edits is now visible for 10k users. 2011-02-02: When a suggested edit is approved, the user who suggested it gets +2 reputation. 2011-01-30: After testing and tweaking, low reputation users can now suggest edits, to be approved by peer review. Edits suggested by unregistered users show as made by Community. People who suggest edits can earn up to 1000 reputation, 2 for each approved edit. 2011-01-27: Area 51 gets an updated design, proposal categories, and a discussion zone. A51 posts are now oneboxed in chat. 2011-01-27: Stack Exchange now uses Lucene instead of SQL Fulltext for search, related questions, and the 'similar questions' in Ask a Question. Option infavorites is no longer supported, some search keys like intitle have changed names, and a new option body is introduced. See the help on the /search pages. 2011-01-21: The three-character requirement for comment @replies has been relaxed for the first word. Like @Jo will now notify Jo Miller, but not John. 2011-01-20: The main list of rooms in chat now displays the global inbox (AKA StackExchange™ MultiCollider SuperDropdown™). 2011-01-18: Sort option "oldest" is back, replacing "newest." 2011-01-14: Tag pop-ups now lists "Followers" which is equal to the number of people who have favorited (marked as interesting) the tag and the number of email subscribers. Subscribing to RSS is not tracked. 2011-01-13: Flag dialog improved. Its "flag for moderator attention" option now provides several default reasons, where appropriate: "not an answer", "low quality" and "should be CW". It allows for longer messages to a moderator. The daily maximum number of flags has been increased. And if a particular user keeps moderator flagging for reasons that are considered invalid, their flag weight decreases. And for those users who continually flag reliably, their flag weight increases. 2011-01-11: Twitter question feeds to publish the most interesting questions on each Stack Exchange site (but not the SOFU trilogy) every three hours. Like: twitter.com/StackProgrammer. 2011-01-11: Authors can now only delete their question if it has zero answers, or only one answer with zero score. In all other cases, voting or flagging is required. 2011-01-08: The "flags" tab in 10k tools was improved; it now shows comment flags in addition to spam/offensive flags, and lets users display the entire post and add their own flag directly from the flags tab. It also preserves the other mod tool tabs. 2011-01-08: When hovering over any tag (like this one: stackoverflow) a pop-up will appear. From this you can subscribe to email notifications, add the tag to your RSS reader and view the tag wiki excerpt. Where no tag wiki is available an invitation to create the tag wiki appears. The pop-up also includes links to the FAQ, Info & Top Users pages for the tag. 2011-01-07: Chat "whitelists" no longer allow specified users to talk regardless of their rep. Users with less than 20 rep now get only four hours of chat time before being locked out. 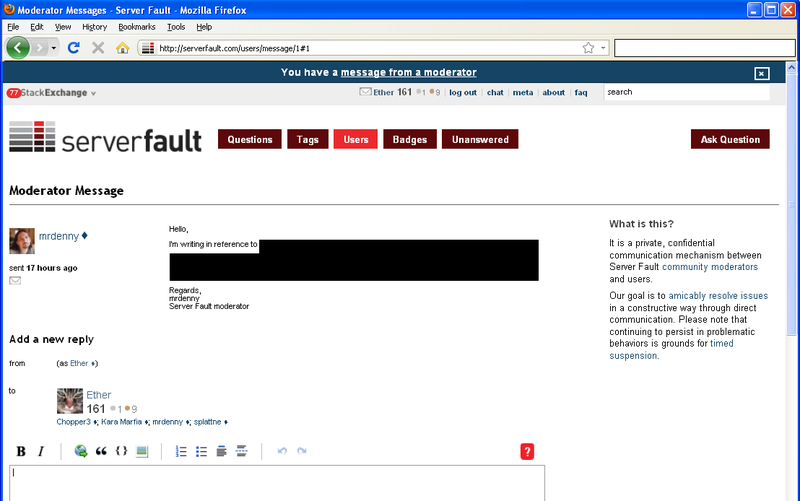 2011-01-07: Moderators can now convert answers into comments. 2011-01-07: The vote-to-close panel now has a more prominent close button (for closing the panel itself, not for voting). 2011-01-06: New "faq" tab added to the /questions page, displacing the "hot" tab (but not removing "hot" functionality). 2011-01-03: Page footers now indicate when a post has been made to the SO blog. 2017-10-28: Controversial Post notice is now live on The Workplace and Interpersonal Skills. If it proves effective, it can be added to other sites as-needed. 2017-10-10: The new top bar is now live on all sites (but not stackexchange.com, chat, or Area 51). 2017-10-09: The aging time for spam and "rude or abusive" flags was changed from two to four days. 2017-08-30: Moderators Review Ban page now includes a new tab showing historical list of users who have been review banned. 2017-08-25: Account deletion process has been drastically simplified. 2017-08-08: The maximum length of a tag has been raised from 25 to 35 characters. 2017-08-04: New footer has been pushed to all sites after several months being in Stack Overflow only. Its main focus is to show links to both Stack Overflow the company and Stack Exchange the network of communities in clear way. 2017-07-27: New Email Settings feature has been implemented, allowing better control over what types of emails users get from Stack Exchange. 2017-07-21: When a post can't be edited, the edit link remains clickable and displays an error popup when clicked, making it consistent with other elements e.g. vote arrows. 2017-07-14: Comments flag dialog has been redesigned, flag reasons changed/merged. 2017-05-16: Official Stack Overflow mobile app is launched for iOS and Android. 2017-05-13: Suggested edits on Stack Overflow now only require two approvals to complete. 2017-04-22: Post authors and diamond moderators can override outcome of a suggested edit (once). 2017-04-12: The earliest year of birth for calculating a user's age has been reduced from 1920 to 1870. 2017-04-06: Links to suggested edits rejected as spam or vandalism will result in fake 404 errors if not logged in. 2017-04-03: Question closure ends the grace period for edits. 2017-03-07: On site main pages, the question preview shown on hovering over a title has been removed because of server load. 2017-03-03: At Stack Overflow 4 Recommend Delete & Delete votes dequeue a post from Low Quality Review Queue instead of network-wide 6. 2017-03-03: Gold-badge holders and moderators can now edit duplicate links. 2017-03-01: Blog Overflow is officially discontinued. 2017-02-28: Authors of answers to deleted questions can now also view them. 2017-02-14: New design for the Top Navigation bar has been rolled out on Stack Overflow. New feature work on the Android and iOS official apps has pretty much been frozen and the developers have been re-assigned to different teams. The apps are still functional, and critical bugs should still be fixed though. Some time after September 2017, Stack Exchange stopped uploading DMCA takedown notices to Lumen Database (formerly called Chilling Effects). This is because the owners of Lumen Database removed the online upload form, and it's too much of a burden to send them via fax or mail instead. The last such complaint was uploaded on September 21, 2017. 2018-12-14: Any validated "rude or abusive" flags on a post will make that post ineligible for use as a "known-bad" audit in the Triage and Low Quality Posts review queues. Additionally, only posts that were deleted by the system in response to spam flags are used as known-spam audits, instead of those with just one validated spam flag. 2018-12-07: The new responsive design was rolled out to all SE sites except Area 51 and its Discussions site. 2018-11-21: Meta Stack Exchange now has its own set of moderators. 2018-11-01: Support for the Internet Explorer browser has been reduced. Internet Explorer 10 is officially listed as no longer supported, and Internet Explorer 11 support will be discontinued if a new feature is released that cannot be made to work properly with it. 2018-10-31: The link insertion and image upload UI have been revamped to show within the editor, rather than as popups; this allows for responsive design. 2018-10-26: As part of the discontinuation of OpenID, stackexchange.com and Area 51 no longer have their own login flow, and their previous login page now redirects to Meta Stack Exchange login. 2018-10-17: The Interpersonal Skills site was excluded from Hot Network Questions. 2018-09-20: The new responsive design has been rolled out to all beta and graduated sites without a custom design. 2018-09-08: Relative links within posts now work properly with the Linked sidebar. unknown: Some red and yellow warnings when asking a question are now shown below the respective input field instead of as a pop-up message. 2018-08-22: New contributor indicator live across the network. 2018-08-17: Design change - all links in posts and comments are now underlined on sites with responsive design. 2018-08-10: New (registered) users can flag comments on their own posts (network wide). 2018-08-07: Updated comment flagging with two options instead of old one "rude or abusive". 2018-08-07: New Code of Conduct is going into effect across the network. 2018-08-07: The "not relevant" comment flag was renamed back to "no longer needed". 2018-07-31: Comment flags dialog changed: "not relevant" wording is used instead of "no longer needed". The dialog and submission acknowledgement prompt also adopted new styles. 2018-07-26: New (registered) users can flag comments on their own posts on Stack Overflow. 2018-07-25: Moderators can see the flagger and timestamp for comment flags. 2018-07-25: Support for OpenID ended. 2018-07-18: Commenting UI changed to make flagging more discoverable by having the comment flag and comment up-vote icons always visible, rather than visible only on hover. 2018-07-13: On main sites, negatively-scored, non-closed questions with positively-scored answers are no longer deleted upon user deletion. 2018-07-12: The moderator-only post issue indicator has a new design that is smaller and uses icons. 2018-07-11: The top bar's sticky behavior has been rolled out to all network sites except Ask Ubuntu (due to clashes with the Ubuntu top bar). 2018-07-05: Favorite Tags renamed Watched Tags on Stack Overflow, Meta Stack Overflow, and Meta Stack Exchange. Will be rolled to all sites at a later date. 2018-07-04: The algorithm for calculating the overall Stack Exchange reputation for Stack Exchange chat was changed to prevent users from simply signing up for 20 Stack Exchange accounts to gain enough rep to chat. 2018-06-13: Closing a question with active VLQ flag doesn't trigger an automatic Community downvote anymore. 2018-06-07: The "activity" tab of a user now has headings indicating the year. 2018-06-01: Display name of a deleted user is now anonymized on close/delete banners. 2018-05-25? : Everything related to age and birth dates was removed from the system, including the profile field, what users entered into it, as well as the corresponding fields in Stack Exchange Data Explorer, in order to comply with GDPR. Cookie warnings were introduced to SE sites, to comply with GDPR rules. A new feature was introduced to allow users to download all prediction data collected from them, as well as disable data collection entirely. 2018-04-27: The feature to allow <5 rep users to ask on the per-site meta about their own post was enabled on Stack Overflow. 2018-02-20: The mobile app is no longer advertised on the mobile site. 2018-02-14: Post owners can no longer delete their own question if at least one of the answers has earned a bounty. 2018-02-13: Bounty owners no longer get their bounties refunded on question deletion if the bounty awardee would get to keep it. 2018-01-11: The number of daily close votes on Meta Stack Exchange has been reduced from 50 to 24. 2018-01-03: The word "hay" is no longer removed from the beginning of posts as a salutation. 2010-12-31: Questions migrated to another site now redirect clicks to the other site instead of staying on the current site. 2010-12-28: Pagination and filtering of user activity now goes back all the way to the first activity. 2010-12-26: After migration, question owners get a header message with migration details. 2010-12-18: Label for code-button in WMD has changed from into . 2010-12-18: Users can no longer enter titles that end with [closed]. 2010-12-17: Favorite tag now inferred based on questions that you have previously visited. Setting an interesting or ignored tag preference disables this feature. 2010-12-16: programmers.stackexchange.com is out of beta. 2010-12-16: Tag sets now support emailing you as new questions arrive in your tag set. 2010-12-16: new /review page on all sites (eg. Stack Overflow, Mathematics) for tracking potential problem posts from new users. This uses some heuristics for detecting a bad answer. 2010-12-12: To make the code highlighting work better, it now uses the question tags to guess what language is used in both the question and its answers. When no guess can be made, or on sites on which highlighting makes little sense (Super User, photo.stackexchange.com, ...) no highlighting will be used. 2010-12-12: The Stack Exchange Data Explorer has moved to data.stackexchange.com. 2010-12-11: New badges for posting in Meta sites: Quorum (bronze) for one post with score of 2 on meta, and Convention (silver) for 10 posts with score of 2 on meta. 2010-12-10: User profiles now display the user's tag statistics (number of questions asked and answers given, along with total question score and total answer score) for each tag on the stats tab. Tooltip gives full details. 2010-12-09: Page titles are now (conditionally) prefixed with the most important tag, for better SEO and to combat scrapers. 2010-12-08: Off topic migration dialog now links to target site faq rather than site itself. 2010-12-08: Comments are no longer pre-expanded after you've entered a single comment, you must re-click "add comment" each time. 2010-12-08: "Self-instigated rep recalc" implemented, though well-hidden. 2010-12-05: Sort option "oldest" for answers replaced by "active", to easily see what has changed. 2010-12-02: Chat now displays a new messages icon next to the "Other rooms you're in" list when users receive replies in other rooms. 2010-12-02: Spoiler text is now supported. 2010-12-02: Talkative bronze badge for chat users. 2010-11-24: Mouseover of chat messages now highlights any replies to that message. 2010-11-13: The "activity" tab of the user profile now gives the option to dynamically show the content of recently posted answers. 2010-11-08: The frequency of the notification envelope lighting up has been toned down in favor of the global inbox. 2010-11-07: Behavior of [tag:tags] on meta sites updated to refer to the parent site by default; new syntax introduced for a meta-site's own tags (source). 2010-11-07: Support for the <kbd> tag re-enabled on Meta Stack Overflow. 2010-11-05: Posting links to the very same site now automatically shows the title. So, just insert https://meta.stackexchange.com/questions/59445/whatever. to become Recent feature changes to Stack Exchange. The title is not shown in the preview, but inserted when the post is created or edited. The title is not updated when it changes, unless the post is edited. It does not work in comments, nor for links to other SOFU sites. Trailing punctuation marks such as a comma, dot or question mark (without URL parameters) to get a readable sentence work just fine. 2010-11-05: Posting tags inside questions and answers now works. Example: instead of writing [`[tags]`](https://meta.stackexchange.com/questions/tagged/tags) to display [tags], users can now write [tag:tags] to display tags. 2010-11-03: Official introduction of tag sets, including wildcard support. 2010-11-02: Threshold for Pundit badge changed from "10 comments scoring 10+" to "10 comments scoring 5+". 2010-10-30: Consecutive-days-tracking calendar added to non-public user profiles. 2010-10-19: Tweak thresholds for Announcer, Booster, and Publicist badges. 2010-10-19: Suffrage and Sportsmanship badges introduced. 2010-10-16: The reputation score on top of each page and on the user page links to the /privileges page (click the numbers). 2010-10-14: Close reason for "migrate to other site" becomes a sub-option for Off-topic. 2010-10-14: Questions can no longer be turned community wiki by non-moderators. 2010-10-13: Bounty events are now added to revision history. 2010-10-01: A "you have gained power" page has been created. It was announced in chat. 2010-10-01: The "Tag Statistics" page link has moved, to stackoverflow.com/tags/<tag>/topusers. 2010-10-01: Automatically-saving drafts for answers. 2010-09-22: Image-based flair now available. 2010-09-14: To ensure that @name replies work, and to not expose part of the OpenID identifier, user names are no longer defaulted to the OpenID name, but to userxxx. 2010-09-07: Bronze tag badges (for earning 100 non-CW upvotes in a tag) introduced. The Announcer, Booster and Publicist badges (for sharing links to questions, which can be tracked now) introduced. 2010-09-06: Hitting Enter now submits comments. 2010-09-01: New badge, Tag Editor (for first Tag Wiki edit) introduced. 2010-08-24: Support for shorter URLs, like stackoverflow.com/q/1732348. 2010-08-17: hot questions formula has been tweaked: Succeeding questions from the same site are penalized by increasing amounts. Community wiki questions are penalized. The benefit of many answers is capped at 10, and we only look at the score of the top 3 answers. We only degrade based on question age, and not the last update date on a question. 2010-08-13: An image-upload capability has been added, accessible through the image option in the toolbar. 2010-08-10: Questions from IP addresses or accounts with a history of extremely poor questions are no longer being accepted. Votes on questions are taken into account, and this yields a permanent IP ban, showing "Sorry, we are no longer accepting questions from this account". 2010-08-06: subjective (and other meta-tags) are now banned. 2010-08-03: Searching within favorites is now included in advanced search. 2010-07-22: "Info" tab of tags, including a tag wiki and a tag synonym proposal system implemented. 2010-07-17: New user preference: I don't want notifications of activity on questions I've favorited (to disable the notification that was introduced 2010-05-31). 2010-07-09: New badges for bounties (Promoter, Benefactor, Investor, Altruist) and a gold-level editor badge (Copy Editor) introduced. Additionally, the origins of badges are now recorded, and visible through clicking on a badge on the Badges page or a user's profile. 2010-07-09: Bounty award tooltips now display the number of bounties awarded and who awarded them. 2010-06-23: Using the browser's Back button towards the user page, now scrolls that page back to where it was. 2010-06-22: Your profile now tracks how many days you have visited the site, and how many consecutive days. This is visible only to yourself and to diamond mods. No more worrying about whether you've missed a day! 2010-06-11: User profile is Markdown enabled. 2010-06-09: Merged questions are no longer utterly annihilated. A stub is left, just like with closing, and the revision list for the target question keeps better details on merges. 2010-06-07: Protected question feature has been added so that 1 rep users can't post/spam on questions with a high search engine ranking. 2010-06-05: Reset post score to 0 on migration, if the score is negative. Automatic 301 Moved Permanently redirects for migrated, deleted questions, for users with < 10k reputation. Add noredirect=1 to avoid this. 2010-06-04: Signatures and taglines are officially discouraged in the /faqs. 2010-06-03: Shadows in popups. New mechanism for displaying and selecting questions when voting to close as a duplicate. Keyboard Esc can be used to close the windows. 2010-06-02: The Super User FAQ now explicitly prohibits shopping or buying recommendations. 2010-06-01: Area comes out of private beta. 2010-05-31: Notification (experimental) of activity in your favorite questions. 2010-05-30: Implemented script that automatically deletes tags six months after they're created if they've only been used once; if necessary, this adds untagged. 2010-05-25: Stricter rules for deleting closed questions. 2010-05-20: To ensure @reply comments work, new usernames must be at least 3 characters. 2010-05-20: New stackapps.com and Stack Exchange API public beta. 2010-05-19: Automatic account association between the trilogy sites. 2010-05-10: Replying to @françois and @jørn can now also be done using @francois and @jorn. 2010-05-09: Reputation report improved, now you can check rep-cap status from purely upvotes (reached) and upvotes + accepts (exceeded). Note that bounties are not included on any of that. And Epic/Legendary badges calculation based on exceeded. 2010-05-08: Search now supports inquestion:this to limit the search to the current question (using the referrer as sent by your browser). 2010-05-08: User profile character limit is now 3,000 characters (up from 2,000 characters). 2010-05-07: @reply to editors of a post even if they haven't commented. 2010-05-07: For new users, unlimited internal linking allowed (within the trilogy). 2010-05-07: "Noise or pointless" added as the Meta equivalent of the "not a real question" close reason. 2010-05-05: Option to "log out everywhere", if you are logged in through multiple computers, and would like to log out from everywhere at once. 2010-05-01: Search now supports +apples +oranges to enforce including words in the results, and inquestion:48105 to limit results to some question. 2010-04-30: The vote-undo locked text was changed into a more specific "You last voted on this question / Mar 28 at 7:55 / Your vote is now locked in / unless this question is edited", hence also allowing you to see when you voted if your memory fails you. 2010-04-25: A new "Linked" posts column on the right, above the existing "Related" posts. It's limited to 50 links, and ordered to put the "best" related links at the top (score, # answers, # views, answer scores). 2010-04-01: Inline links in comments, [the Markdown way](http://example.com). 2010-03-30: Auto-comments when voting to close as duplicate, also auto-deleted if the question indeed gets closed and the comment still starts with "possible duplicate of". 2010-03-27: Forced to wait before accepting an answer. 2010-03-22: Bounties can no longer be awarded immediately, but only after one day. 2010-02-08: Despite earlier drastic reductions of the vote-undo window in August 2009, that vote-undo window has been relaxed to 5 minutes. 2010-02-03: Direct links to last activity, which could be an edit of an existing post. 2010-01-29: Timeline Question View (like this). 2010-01-16: Comment formatting and replies in New, Improved Comments with @reply. See also the FAQ: How do comment replies work? 2009-12-27: Edit your own comments, within a 5 minute window, yielding the little pencil icon: . 2009-11-30: Show up/down vote totals when clicking the vote count: Need a minimum number of reputation points to see this (currently 1,000, though it could vary from site to site). 2009-10-02: Cut off internal links in comments show the question title (actually: the text after the question number in the URL, without the dashes) in the hover text. Is there a list of rules?